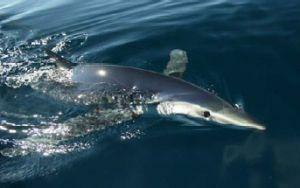 The blue shark recaptured by a longliner off South Africa swam 5,837 miles since it was tagged and released off Southern Australia on May 20, 2005, Fishing World reported. That's more than the distance from Los Angeles to New York and back. But that's nothing. A great white shark, whose species enjoys the longest migratory range of any marine creature on record, once reportedly swam 12,427 miles from Dyer Island, South Africa, to Western Australia and back in just under nine months. Fishing World. What a shark tag looks like.